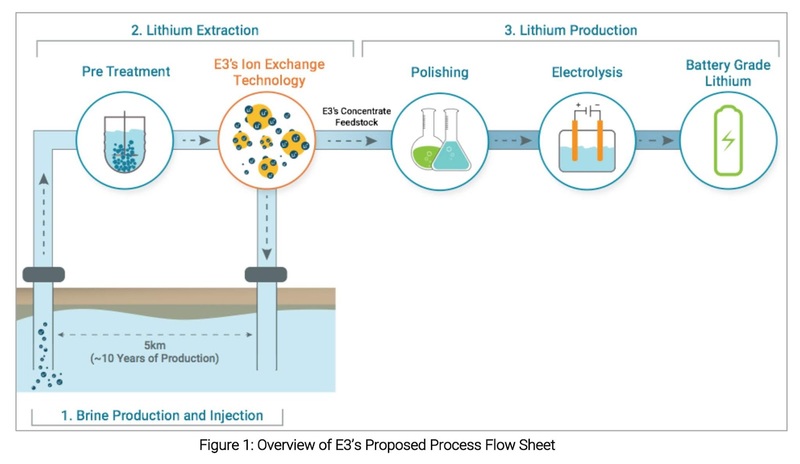 E3 Metals Corp. has announced it has begun the development of its field pilot plant which will incorporate E3’s proprietary concentration technology to further validate the lithium extraction component of the process flow sheet. 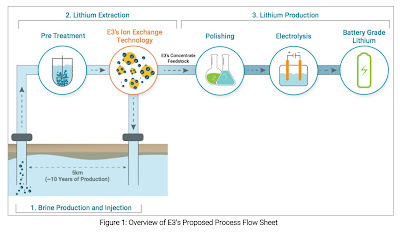 This technology has the potential to unlock significant value from E3’s expansive lithium resources of 6.7 Mt LCE (inferred) in the Leduc Reservoir in Alberta. 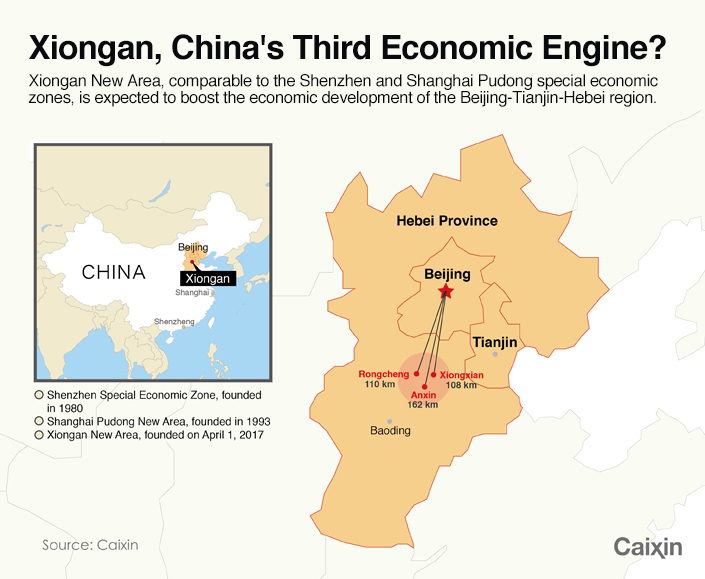 Iceland's Arctic Green Energy Corporation and China's Sinopec (SNPMF) have secured a $250 million loan from the Asian Development Bank that will help develop geothermal resources in China. A geothermal power plant located about one mile from the community of Anderson Springs was approved Thursday by the Lake County Planning Commission for a use permit extension which will endure for the entire productive life of the project. The Bear Canyon Power Plant is owned by Calpine Corporation and has been out of service since 2015. When in operation, the plant, according to Environmental Planner Eric Porter, can generate enough power to serve 10,000 homes, representing 20 percent of Lake County’s geothermal energy output. Calpine is currently undecided about whether or not the plant will be put back into service, but as Regional Manager Bruce Carlsen suggested, a “life of project” permit is better for business than a time-restricted one. “We think ‘life of the project’ is really good for our business,” Carlsen said. Calpine, which had been a publicly traded entity, went private earlier in 2018. The Bear Canyon plant would not, under the permit issued Thursday, be allowed to expand or change the plant’s operations, and Environmental Planner Eric Porter, who presented Calpine’s request, commented that the plant was “not changing in size.” Under the permit issued, Calpine can resume operation of the plant if the company sees fit, or in the case that “reclamation” was decided on, Calpine would demolish the structures already present on the property. Calpine is a Gold sponsor of the GRC Annual Meeting & Expo, 14-17 October at the Peppermill Resort Spa & Casino, Reno, Nevada, USA. 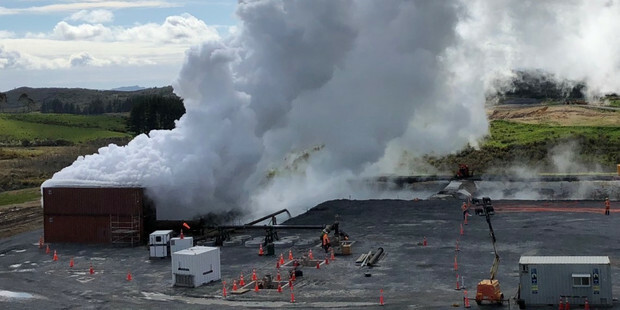 Te Ahi O Maui geothermal power plant, in Kawerau, has entered the commissioning phase. Once fully operational, the plant will generate around 25 MW of baseload renewable energy. Initially considered a 22 MW plant, the Te Ahi O Maui plant is expected to achieve around 25 MW – enough to power over 25,000 average homes. The increase in output has improved the plant construction cost, including drilling, to $5.45m/MW. Around 20 representatives from different local government units, National Commission on Indigenous People (NCIP), Department of Environment and Natural Resources (DENR) and other stakeholders gather to discuss with the Department of Energy (DoE) the geothermal viability of Mt. Malindang in the province of Misamis Occidental. Headed by DOE's Renewable Energy Management Bureau (DoE-REMB) in partnership with the Philippine Information Agency (PIA), the stakeholders were informed about the possibility of putting up a Geothermal power plant in Mt. Malindang which can ease the province's problem on power crisis. How can countries, like Indonesia, access the financing—but also knowledge and solutions—they need to make the critical, but costly, investments toward sustainable and inclusive development? 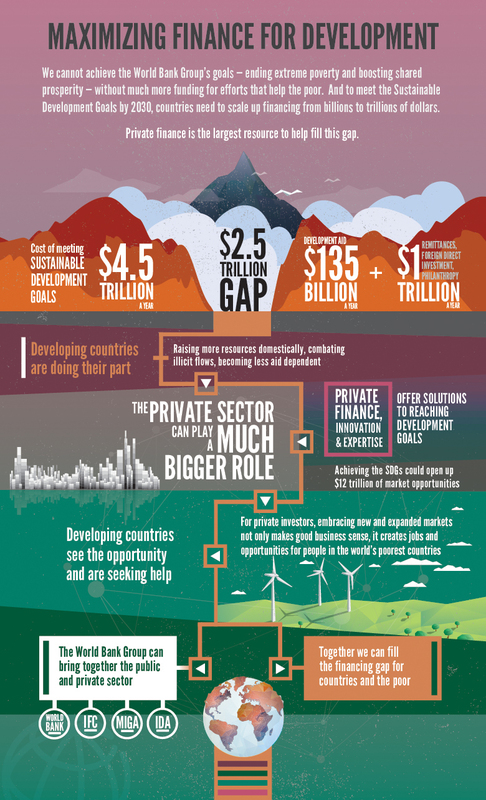 With challenges like this in mind, the World Bank Group is redefining how it thinks about development finance. Building on efforts to mobilize needed resources for member clients, the Bank Group’s Maximizing Finance for Development (MFD) approach is systematically leveraging all sources of finance, expertise, and solutions to support developing countries’ sustainable growth. The total global capacity stands now at 14,369 MW. 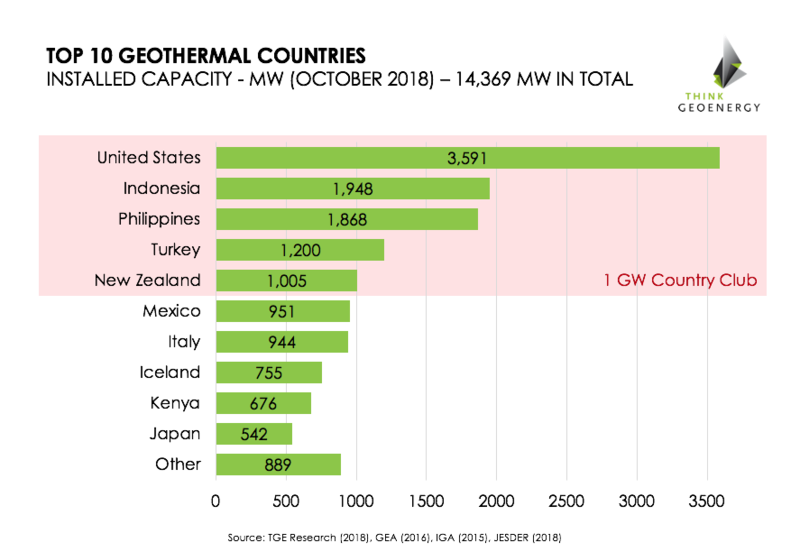 While the U.S. continues to be the largest geothermal country by far, limited development activity sees countries such as Indonesia and Turkey catching most of the attention. 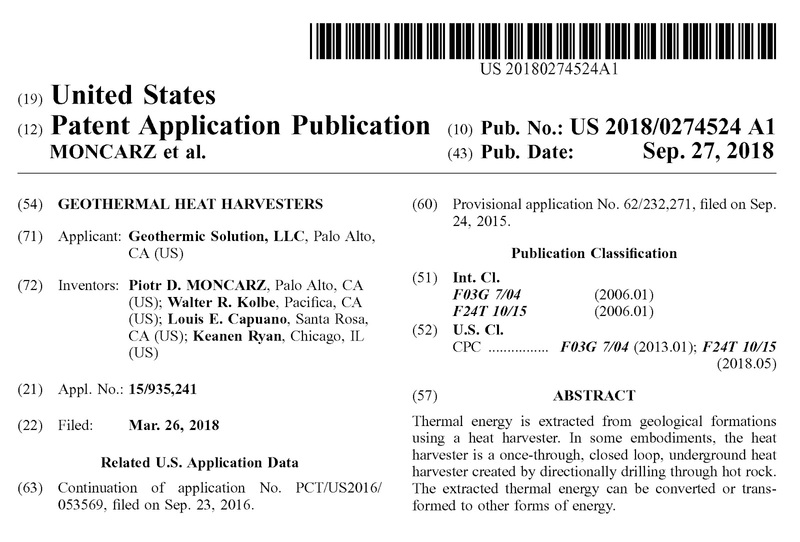 Thermal energy is extracted from geological formations using a heat harvester. 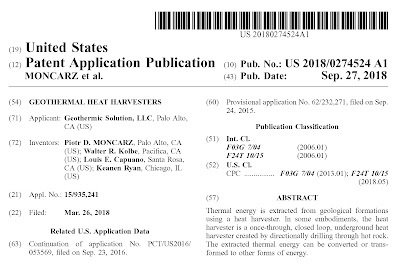 In some embodiments, the heat harvester is a once-through, closed loop, underground heat harvester created by directionally drilling through hot rock. The extracted thermal energy can be converted or transformed to other forms of energy. The Philippines Department of Energy (DoE) is undertaking a study on the potential of the Mati-Lupon-Tarragona geothermal field in Davao Oriental, officials announced. The Davao Oriental provincial government, in a statement, said the identified area covers the villages of Buso in Mati. Cabagayan in Tarragona town, and Don Mariano Marcos in Lupon. DoE Science Research Specialist II Joel Miguel said the study, which already started in other areas in 2017 and is targeted for completion by 2021, is intended not just to look into Mati-Lupon-Tarragona’s potential energy source, but also to update the national database and identify areas for geothermal development. Governor Nelson L. Dayanghirang welcomed the exploration saying he hopes that the province would be able to contribute in power generation for economic growth. The global potential for geothermal is estimated to be in the region of 200 gigawatts. Countries in the Gulf Cooperation Council (GCC) are already considering it a viable option for alternative energy as the region increasingly looks beyond fossil fuels for its power plants. Dubai in the United Arab Emirates is already considering the use of geothermal energy to provide power needs in desalination plants, with preliminary studies into the energy source already showing promising results. According to experts, geothermal is more suitable for applications such as desalination rather than power generation since UAE’s temperatures are below 200°C, the minimum temperature required for power generation from geothermal energy, which is a result of heat from beneath the Earth’s surface. Neighbouring Saudi Arabia is eyeing geothermal power as part of its strategic energy plan that also includes massive use of solar energy and wind farms. Speaking last year at the World Future Energy Summit in Abu Dhabi, Saudi energy minister Khalid Al Falih highlighted the Kingdom’s rich geothermal resources, which are located mainly in the country’s western region. Saudi Arabia’s geothermal resources are related to the general tectonic activity of the Red Sea and associated with a series of volcanic rocks and ridges. A mio avviso ed auspicio la Toscana, grazie alle sue straordinarie risorse, continuerà a giocare un ruolo di spicco a livello mondiale per la produzione di energia elettrica e potrà ampliare notevolmente la produzione di calore realizzando reti di teleriscaldamento e piccoli impianti per uso del calore in molti luoghi, con livelli di elevata efficienza energetica e professionalità altamente specializzata. Tutto questo non può essere realizzato con imperativi a mantenere lo status quo, paure, minacce o pressioni: occorrono volontà ad innovare e migliorare, opportunità per la ricerca e sistemi di misura e controllo, la messa in opera di sistemi di partecipazione dei cittadini che, con modalità ben definite e tempi certi, porteranno a progetti che tengano conto di tutti i pareri. (From Google Translate) In my opinion and I hope Tuscany, thanks to its extraordinary resources, will continue to play a prominent role in the world for the production of electricity and will significantly expand the production of heat by creating district heating networks and small systems for the use of heat in many places, with levels of high energy efficiency and highly specialized professionalism. All this can not be achieved with imperatives to maintain the status quo, fears, threats or pressures: we need to innovate and improve, opportunities for research and systems of measurement and control, the implementation of systems of citizen participation that, with well-defined methods and certain times, they will lead to projects that take into account all the opinions. The August/September issue of the European Geothermal Energy Council (EGEC) Newsletter is now available. Reporter Daniel Rothberg sat down with Jim Faulds, director of the Nevada Bureau of Mines and Geology and long-time GRC Member. The bureau, which serves as the state’s geological survey, develops maps that assess everything from earthquake risk to geothermal potential. They talk about the state’s dynamic geology, why Nevada came to be targeted for mineral exploration and how much more there is to learn about the processes that continue to shape the Basin and Range. Jim Faulds will lead a GRC Fieldtrip - Searching for Blind Geothermal Systems utilizing Play Fairway Analysis, Western Nevada - on Thursday, October 18, and will present two Technical Papers at the GRC Annual Meeting & Expo, October 14-17 at the Peppermill Resort Spa & Casino, Reno, Nevada, USA. The team at Fervo Energy, an enhanced geothermal startup that has secured funding from Breakthrough Energy Ventures. COURTESY FERVO ENERGY. Fervo Energy’s CEO Tim Latimer, who previously worked as a drilling engineer for BHP Billiton’s shale operations, says the startup intends to use the funding to move forward with field deployments to test and refine their so-called enhanced geothermal systems. The company’s other cofounder is Jack Norbeck, who was a reservoir engineer at The Geysers in Northern California, the world’s largest geothermal field. Fervo’s founders – currently fellows at the Cyclotron Road program at Lawrence Berkeley National Laboratory – believe they can improve the performance of enhanced geothermal systems, by isolating multiple zones inside a well and optimizing water flow within each of them. While some of the technical details are proprietary, Latimer says the company is using horizontal drilling techniques that have become far cheaper, thanks to improvements developed by the booming natural gas industry. It is also employing fiber optic temperature gauges that can run through underground wells, along with other sensors and simulation software, to create a clearer understanding of underground structures and dynamics. What will it take to put geothermal energy to use on a large scale? Iceland uses it nearly exclusively for heat and hot water and for about a fifth of its electricity. Many countries have geothermal projects. But the vast stores of heat deep beneath Earth’s surface remain largely untapped. “If we can unlock the technologies to make extracting heat in the subsurface technically and commercially viable on a large scale, the promise is huge,” says Bridget Ayling, director of the Great Basin Center for Geothermal Energy at the University of Nevada, Reno (and GRC Board member). That’s why, she adds, “despite only incremental gains over the last 40 years, the geothermal community continues to pursue engineered geothermal systems,” or EGS, also known as enhanced geothermal systems. Silenos Energy hat die erste geothermische Tiefbohrung in Garching a.d. Alz abgeschlossen. In 3.832 Metern Tiefe ist das Unternehmen im Malm der bayerischen Südost-Molasse auf heißes Thermalwasser gestoßen. Nach einer zweiwöchigen Testphase konnte Silenos Energy nun erste Ergebnisse dieser Bohrung präsentieren. „Der Fördertest hat ergeben, dass wir mit unseren Prognosen richtiglagen. Wir sind auf rund 125 Grad Celsius heißes Thermalwasser gestoßen. Was die Fördermenge aus der durchgeführten Bohrung betrifft, konnten wir unser Ziel mit 105 Litern pro Sekunde erreichen“, so Oliver Friedlaender, Geschäftsführer von Silenos Energy. (From Google Translate) - Silenos Energy has completed the first geothermal deep well in Garching ad Alz. At a depth of 3,832 meters, the company has encountered hot thermal water in the Malm formation of the Bavarian south-east Molasse. After a two-week test phase, Silenos Energy was able to present the first results of this drilling. "The funding test showed that we were right with our forecasts. We encountered about 125 degrees Celsius hot thermal water. As far as the output from the drilling is concerned, we were able to reach our target at 105 liters per second, "says Oliver Friedlaender, Managing Director of Silenos Energy. Germany: Drilling Operations for the Neuried Geothermal Power Plant "Will Begin in the Near Future"
Geysir Europe GmbH, a subsidiary of Daldrup & Söhne AG, has been granted the concession for the exploratory field in the Neuried claim by the responsible regulatory authority in Freiburg, Germany. The concession, which was awarded by the state office for geology, raw materials and mining (LGRB), gives Geysir exclusive rights to access the claim for the planned geothermal drillings. "We are very happy to have been granted the concession by the Baden-Württemberg state authorities," says Josef Daldrup, CEO of Daldrup & Söhne. "We will quickly start working on the next procedural steps. Daldrup already owns the premises for the operations. That means the drilling operations for the geothermal power plant in Neuried will be able to begin in the near future, in line with existing plans." Fervo Energy: - founded by Tim Latimer & Jack Norbeck. A startup rethinking geothermal power with the help of modern computational models and horizontal-drilling technology. Fervo hopes that the technology it is developing will cut the cost of geothermal power by some 50%. The Geoscience Research and Applications Group has an opening for a Department Manager for the Geothermal Research Department. You would be responsible for providing leadership and advocacy for a team of highly talented and experienced engineers, scientists, technologists, post-docs, contractors, and student interns with a broad range of backgrounds including mechanical engineering, electrical engineering, chemical engineering, and geoscience. Core to this department is leadership of Sandia’s engagement and research for the Department of Energy’s Geothermal Technologies Office and building the labs capabilities in drilling and subsurface access and sensing. Working with the leadership of other programs to apply the department’s capabilities to Nuclear Waste Management, Fossil Energy, Nuclear Non-proliferation, Nuclear Deterrence, National Security Programs and other appropriate mission areas. NiMBUC Geoscience of Vienna, Austria extends its activities in the geothermal sector. Recently, we conducted witnessing of LWD logging in a deep geothermal well onsite in the Molasse Basin in Southeast Bavaria. The well is part of a doublet system that will produce hot water driving a power plant. Geothermal energy is a local, sustainable, reliable and affordable source of energy deep below our feet, which will play a substantial role in the sustainable energy mix of the future. During this geothermal symposium the different steps from exploration to operation will be discussed. A new geological model of the deep subsurface of Flanders and the results of novel geophysical exploration techniques will be presented. The Flemish legislation (guarantee scheme and permits) for the geothermal market is in full development. Both the Flemish and European context will be explained here by specialists. After lunch, at the end of this symposium, you can visit the Balmatt geothermal power plant at VITO in Mol. When Jacco Besuijen gives a PowerPoint presentation, you’d be hard-pressed to know he’s a manager at one of the Netherlands largest tomato growers. Instead he could be mistaken for an energy provider. “Our greenhouses have three key needs: heat, electricity and CO2, in addition to water,” he explained to the Weekly Times, on an exclusive tour last month. “To power this we need half a megawatt of installed power per hectare, across our 418ha of greenhouses, which is overseen by eight energy managers in one location who monitor all 52 greenhouse sites around the Netherlands. “In the early days we used oil boilers, then gas, followed by cogeneration but now because the Netherlands imports a lot of gas from Russia and because of the need to stop using fossil fuels we are looking to use geothermal heat. In less than three years, KS Orka has acquired an extensive project portfolio in Indonesia, engaged three drilling rigs and secured 120 MW of proven steam under well-head. With a focus on the graphical aspects, this workshop will present the methodologies employed in the industry to accurately build resource models at the different stages of the exploration and development of a geothermal field. This workshop will follow the typical development order of any geothermal project; starting from the initial conceptual models resulting from the surface exploration phase, to the integration of sub-surface data in three-dimensional models during the development phase and the use of advanced numerical models to manage the reservoir during the production phase. During this workshop, numerous case studies from around the world will be studied in detail with the participants, including some of the world’s largest geothermal fields located in the United States, Indonesia and Iceland. Bring your computer as participants will have a hands-on experience! The government needs some $14.1 billion (about Sh31.8 trillion) to finance 30 projects in an effort to attain an industry-driven economy, according to The Citizen calculations from figures compiled by the Tanzania Investment Centre (TIC). In the energy sector, there is an $821 million worth Mbeya-based Ngozi 200 megawatts Geothermal Plant, which involves development of 600 MW geothermal plant in two phases with 200 MW for Phase I and 400 MW for Phase II. Ruben Havsed will be attending the GRC Annual Meeting & Expo from 14-17 October in Reno, nevada, USA. The Inter-American Development Bank (IDB) has awarded a $51.6m loan to Bolivia last week to promote the country's sustainable energy development. The multilateral said resources will promote geothermal, solar and wind power in the nation, which currently produces 80% of its electricity demand through fossil fuels. IDB’s loan consists of a $48.86m 2033 portion awarded from the bank’s ordinary capital to be paid back at a Libor-linked price and a $7.74m tranche at 0.25% interest for an 80-year term and 40-year grace period. Philippines company Energy Development Corp. (EDC) plans to participate in the auctions for new geothermal contracts in Chile and Peru as part of its expansion program, a top executive said. EDC president Richard Tantoco said the new concession area in Chile that the company was looking at could produce about 150 megawatts of geothermal capacity. EDC already has a stake in the Mariposa project, located in the Andes Mountains 300 km south of the capital city of Santiago. The project covers two geothermal exploitation concessions, Pellado and Laguna del Maule. The rights to these concessions are owned by Compañía de Energía Limitada where affiliates of EDC and Canada-based Alterra Power Corp. hold 70-percent and 30-percent stakes, respectively. Over 60 hours of high-quality presentations on the latest developments in geothermal energy on October 15, 16 and 17. Register Now! Earlybird Discount Ends September 30. The Minister of Mines and Steel Development, Alhaji Abubakar Bwari, says for the Federal Government to provide the enabling environment for business to thrive, it must look at the untapped potential of geothermal energy. 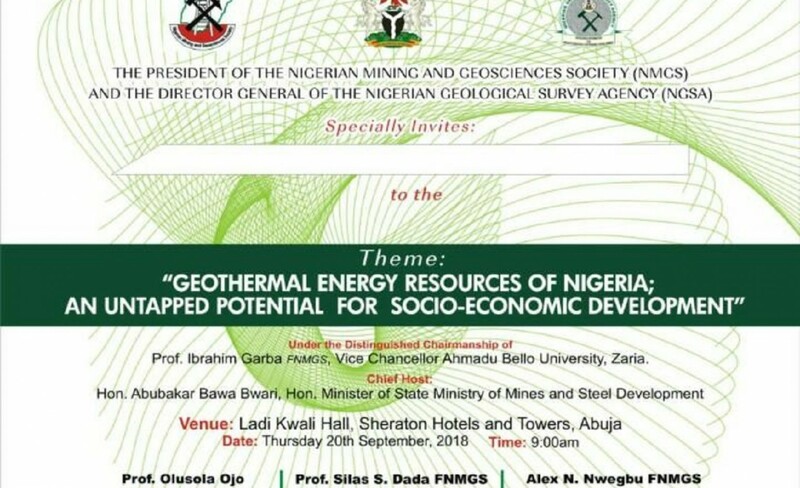 Bwari said this in Abuja on Thursday at the Nigerian Mining and Geoscience Society and the Nigerian Geological Survey Agency discourse series on ‘Geothermal Energy; an Untapped Potential’. Popular excursions from the GRC Annual Meeting & Expo in Reno, Nevada, USA. A GRC Fieldtrip in Nevada, 2015. The Geothermal Resources Council (GRC) has announced more details of events at the world’s largest annual geothermal energy conference in Reno, Nevada, USA. In addition to the main event of the GRC Annual Meeting & Expo taking place October 14-17, 2018, there will be a grand total of four fieldtrips before, during and after the conference. On the day after the GRC Annual Meeting & Expo there will be a day-long fieldtrip travelling south from Reno to visit the southern Gabbs Valley in western Nevada, where state geologist Jim Faulds will demonstrate how a blind geothermal system was recently discovered through application of play fairway analysis. More information on the fieldtrips, including more detailed itinerary and cost, can be found on the GRC Website at https://geothermal.org/Annual_Meeting/fieldtrips.html. Under general supervision assists with field projects, performs sampling functions and maintains field equipment. Our declining coal industry means that as deep mines were abandoned, water pumps were turned off and the worked areas flooded with water which now lies at temperatures of around 12 to 20°C. Spread the previously mined coal over the entire UK land surface and there would be a layer of coal around 5 cm deep. The extracted coal has left void space underground, and allowing for subsidence, we estimate that there are around 2 billion cubic metres of water within flooded, abandoned coal mines. Using heat pumps, we can upgrade the temperature of this water to provide useful temperatures for space heating. The beauty of this concept is that because many villages, towns and cities were developed due to the coal deposits beneath them, there is good correlation between areas of heat demand and abandoned coalfields. It is estimated that the resource potential of the UK could provide heat for around 700,000 homes. projects that PPC Renewables are planning. PPC Renewables plans to start developing two of four geothermal fields to which the company holds exclusive exploration and utilization rights with ventures on the island of Lesvos and on Methana, a peninsula in northeast Peloponnese. On Monday, 26 September 2018, the United Nations University (UNU) Fellows of the Six Month UNU Geothermal Training Programme (UNU-GTP) will introduce their final projects. The lectures will begin at 9:00 in Víðgelmir at Orkustofnun, Grensásvegi 9, IS-108 Reykjavík, Iceland. This is a good opportunity for those interested in geothermal science and engineering in developing countries to find out the latest research in the respective fields. Toyota Motor will be a key investor in a Sparx Group renewable-energy fund announced Wednesday, aiming to reduce carbon emissions from its auto factories and dealerships. The British Geological Survey has worked with the wider geoscience community to identify two preferred geological locations. The first research field site will be in the Thornton area (Cheshire) and the second research field site will be in Glasgow, Scotland. The research field sites will allow independent, rigorous and replicable observations of subsurface processes. The UK Geoenergy Observatories will stimulate research on underground energy technologies that will answer vital questions about how they affect the environment. Geothermal Event - Hotel Room Block Discount Ends Today! GRC Annual Meeting & Expo: Make Your Hotel Reservations Now!